Born and raised in Ruislip, West London, Andy Serkis showed a talent for art when he was young, and wanted to become a painter/graphic artist. He studied visual arts at Lancaster University, but while there, he became interested in the theater studies department, and discovered a love of acting after performing in a play. After graduation, he began working at the Dukes playhouse in Lancaster, where he performed in numerous plays, playing a wide variety of characters. In 1989, Andy landed a role in the Royal Exchange Theatre's production of Macbeth, then went on to play The Emcee in Cabaret at the Sheffield Crucible, Macheath in The Threepenny Opera for the Bubble Theatre and Jerry in the musical version of Some Like It Hot at the West Yorkshire Playhouse. His first acting award was a Manchester Evening News Best Actor award for his performance in Decadence. During the '90s, Andy made the leap to appearing onstage in London, receiving critical success for his roles in Hush, King Lear and Mojo. At the same time, he began landing roles on the television series Finney and Streetwise, as well as in TV movies and mini-series such as Grushko, The Jump, The Arabian Nights, Touching Evil, Shooting the Past and as Bill Sykes in the 1999 mini-series Oliver Twist. His feature film debut was in Prince of Jutland (1994), starring Gabriel Byrne and Helen Mirren. Other roles in features, such as Mike Leigh's Career Girls (1997), followed. Although he returned occasionally to the stage, Andy concentrated mainly on film work, and in 1999, he was offered the prize role of the hissing, bitter, yet strangely sympathetic Smeagol (aka Gollum) in Peter Jackson's film trilogy version of J.R.R. Tolkien's The Lord of the Rings saga. All three films were shot back-to-back in New Zealand over a space of 18 months. When filming was finished, Andy managed to squeeze in appearances in two films — 24 Hour Party People (2002) and Deathwatch (2002) — before being called to do post production work on the second and third Lord of the Rings films. 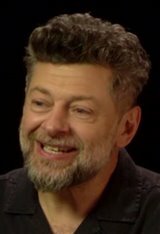 Because of the complicated technical aspects of creating the computer-generated Gollum on screen, Serkis spent most of 2002 in the studio working on The Lord Of The Rings: The Two Towers , and will spend much of 2003 on The Lord of the Rings: The Return of the King . He received an Online Film Critics Society Awards nomination for "Best Supporting Actor" for his work in The Lord Of The Rings: The Two Towers and found himself the object of much speculation as to whether or not he should be considered for an Oscar, because although his character was computer generated, Gollum was modeled on Andy's actual movements and as well, Andy provided the voice. For his work in King Kong (2005), he won a 2006 Special Citation from the Toronto Film Critics Association Awards for his unprecedented work helping to realize the main character in King Kong (2005), as well as a VES Award from the Visual Effects Society Awards for Outstanding Animated Character in a Live Action Motion Picture. In 2012, Andy had the opportunity to slip back into his Gollum character for the prequel film The Hobbit: An Unexpected Journey , the first part of another trilogy, this time a prequel to The Lord of the Rings. In his spare time, Andy, a vegetarian, still loves to paint and has a passion for mountaineering. He lives in North London with his wife, actress Lorraine Ashbourne and their three young children.